It’s not uncommon for tenants to pay RENT late in December or try to make payment arrangements during this time of year. During the holiday season, most people do everything they can to pull together a little extra money to purchase presents for loved ones, prepare a delicious feast or treat themselves to one of many holiday concerts and events. Other seasonal issues that may cause someone to spend more than they mean to include a car accident on a snow day, illness or injury that results in missed work, maternity leave or seasonal layoffs. When budgets are stretched tight, some tenants may feel like they can push the rent a little and hope that a generous landlord will look the other way or not be as strict due to the season. Most tenants don’t understand the bind they put landlords in when they are late with the rent or don’t pay at all. 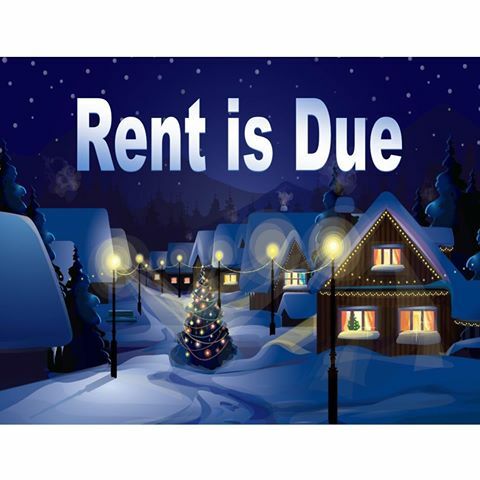 When your tenant is late with the rent in December, what are your options? If your tenants have an excellent history of paying on time, and seem to have an issue during the month of December, you can go with your gut and make any exceptions you feel are necessary. Depending on their reasons and your situation, you may see a need for leniency. While your own financial obligations and duties should come before anyone else, if there is any way you can manage with a delayed payment and feel the desire to do so, you can consider it. If your tenants are often late and you worry that they won’t make up for the late rent, keep things professional and as strict as usual. While you may not like the idea of starting eviction proceedings just before the holidays, it may be necessary to either force the tenants to pay up or to minimize your financial losses in the long run. Even if the tenants are dealing with something out of their control, like extended unemployment, you must ultimately look out for your own interests and make sure you don’t jeopardize your business interests. Allow the late rent to pass but arrange for the tenant to pay back rent in January/February when they get their tax return. Split the back rent plus late fees over the following two months until it is paid in full. For example, if the rent is $500, the tenant would skip December, and then pay $750 in January and $750 in February (plus any late fees you arrange for). Allow a discount of a certain amount as a “holiday gift,” only if the tenant pays half now and the balance in January. Arrange to have the tenant work off the rent by shoveling snow, cleaning empty units, maintenance or if their profession is a service you’d like to trade for (mechanic, plumber or other). Provide them with an emergency list of charitable organizations in your area that help troubled tenants pay rent and work with the agency to settle the tenant’s December account. Not every tenant deserves your consideration and assistance in making the rent and for those tenants, you should take swift and immediate action to ensure your business doesn’t suffer. Remember, the more your tenants are allowed to delay paying rent, the greater the risk that you won’t be able to make your financial obligations as a landlord. However, good tenants are hard to find and it may be worth your while to be lenient with those who have run up against hard times during the holidays. When you take the time to be good to good tenants, it can have long-term benefits for you in retention. Have you ever felt the need to be lenient with a tenant? Was your good will rewarded or do you regret it? Please share this article and let us know about your experience in the comments section!